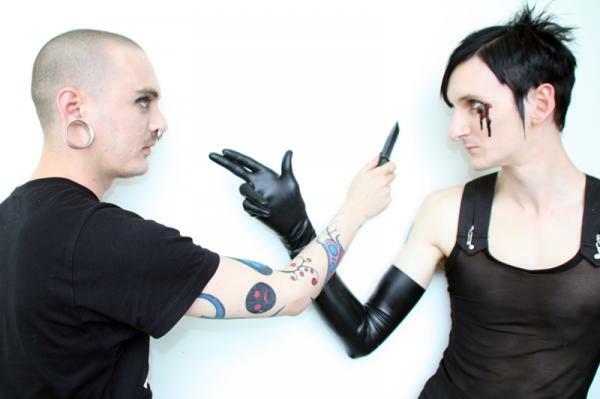 Shiv-r is a new force in the field of dark electronic music and in 2010 signed simultaneously to Infacted Recordings (Germany), Metropolis Records (North America) and Deathwatch Asia (Japan/Oceania). The key characteristics of the Shiv-r sound are haunting, neoclassical melodies, harsh percussive club sounds, clean male vocals delivered in shouts and whispers, sparse rhythm guitars and an overwhelming dark atmosphere. The duo consists of Pete Crane (aka Virul3nt) and Lee Bulig (aka Kong), with both collaborating on the music and Pete taking up vocal duties. The 2 members have already built up an impressive discography prior to starting this project. Lee Bulig is the solo mastermind of projects Stark, which released 2 albums and 1 EPCD on GUP, and Neon Womb, releasing 1 album on Cranial Fracture Recordings. Pete Crane is responsible for creating all music for The Crystalline Effect, releasing 2 albums and 1 EPCD on different labels, and Plague Sequence, with 1 EP and 1 album released on digital labels. The 2 members are originally from Australia, however Shiv-r was conceived while Pete Crane was living in London and Lee Bulig was living in Bangkok, with the members coming together for live shows and photoshoots. Pete has used this time in Europe touring regularly and performing with his own projects and as a guest in other bands at internationally renowned gothic/industrial festivals and clubs. Lee's past releases were infamous for their unsettling darkness and were reviewed to draw directly from the depraved aspects of humanity, and his time in the pollution and uncertainty of Bangkok has fed this. Despite the geographical distance, the 2 personalities have been collaborating on music in various projects for the better part of the last 10 years, so are in tune enough to write together in sync over long distances.